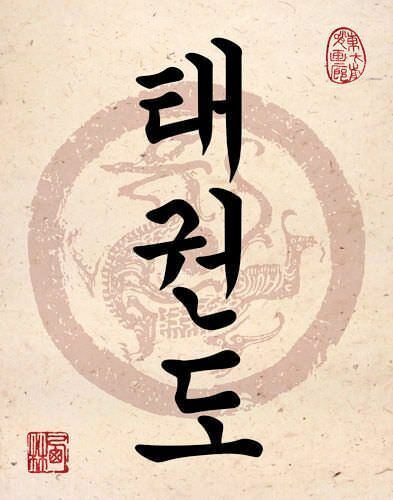 Artwork Panel: 85cm x 32cm ≈ 33½" x 12½"
Silk/Brocade Border: 105cm x 42cm ≈ 41¼" x 16½"
This is the title "Taekwondo" written in modern Korean Hangul. This one was written by a fugitive North Korean near the border of North Korea and China. The artwork is not signed by the artist (for fear or retribution if his name appeared on the artwork). If you are interested in ordering custom Chinese / Japanese Kanji / Korean Hanja calligraphy, just check out our Taekwondo Calligraphy web page. This title is written the same in Chinese, Japanese Kanji, and old Korean Hanja, making it rather universal (pronunciation is different among these languages, but the written form is the same).